Full Service Railway Contracting Company | Remcan Projects LP. Everyone says they want to be safe, but at Remcan it’s more than just a talking point. We spend the time and resources necessary to ensure that our crews are trained and tested and our equipment is in proper working order. We adhere to every industry safety standard and regularly review our processes for safety improvements. Quality is not optional at Remcan. It dominates every aspect of our work. We deliver every project with the highest standard of quality, born from our careful processes and keen attention to detail. We never leave a job site without knowing that the project you wanted was the project that was delivered. Remcan is well known for their responsiveness and that’s by design. When you have a problem or need help to maintain, repair or build a new section of track, bridge or signals, you don’t have time to wait. Our entire team to puts responsiveness at the top of their priority list, ensuring no client is ever left wondering if they can count on us to deliver. We innovate to maintain high standards of quality, safety and efficiency. Remcan focuses on innovation because we know that there are always ways to improve on the work we know and love. Finding new ways to meet old requirements that are safer or more efficient means we can deliver higher value to our clients each and every day. Are you in the process of selecting a new partner in railway track construction and maintenance? 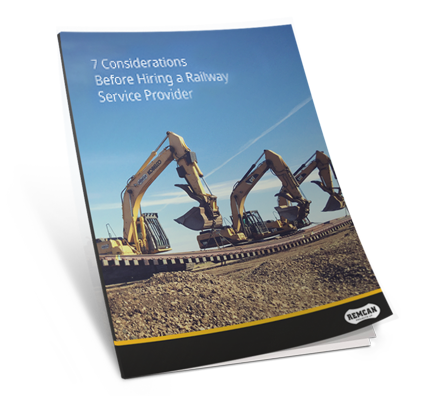 Download this whitepaper for 7 tips on how to pick the right railway contractor for the job.